I am working on a pretty big and complex project and I was thinking today that I wish there was a way I could add a comment to a module, column or row settings area. For example, I have a gallery that the images need to by 300×300 to look right, so I would like to be able to leave myself a note if you will on the module, so I don’t have to open the gallery and go look at the photo settings to find the size. Another example, say I have a row that has custom CSS, I would like be able to call that out right from the General Tab, so I don’t have to go over to the advanced tab and scroll down to figure out that I have a custom class in play. 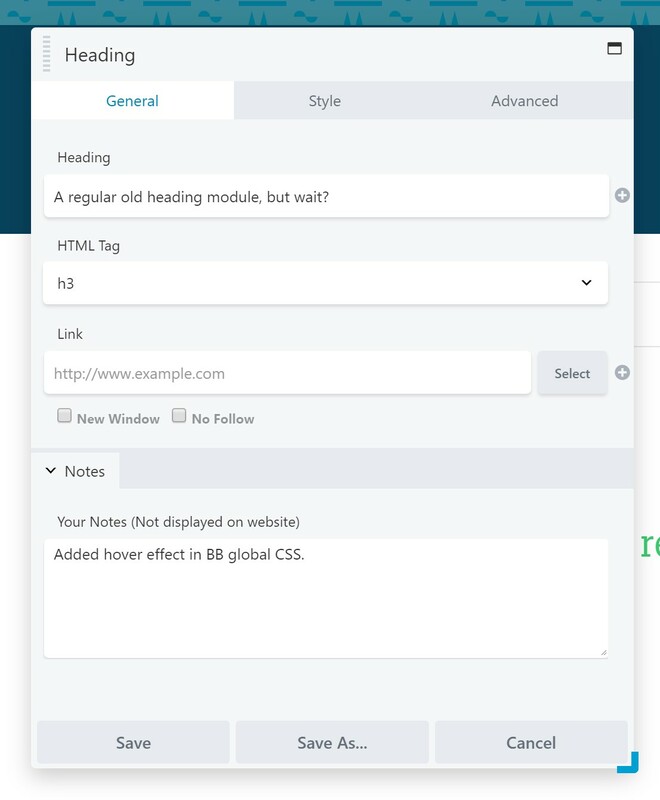 /* Add the notes field to all BB modules, rows, columns. Notes field found in the advanced tab. Over 1,000 Beaver Builders can't be wrong! We've got a million ideas that we've implemented on over 100+ BB enabled websites.